Necessity is the mother of invention- and in this case, a need to not frequently handle feed bags due to a dust allergy inspired the creation of this multiple-week feeder. 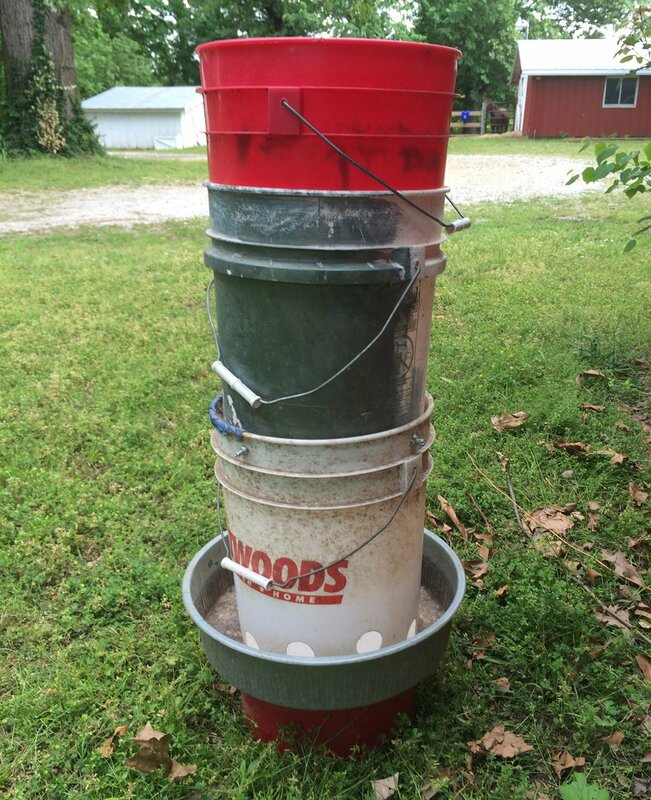 This feeder is made from materials you may already have on hand and will hold a full 50lb bag of chicken feed and slowly drop it into the feeder pan over the course of several weeks. **This tutorial calls for more tools than my typical tutorial. If you don’t have a jig saw, a hand saw should work. Alternately, almost every pawn shop has a few jig saws on their shelves starting at around $10 or $15. My jigsaw was a $10 pawn shop buy and is going strong 3 years later! 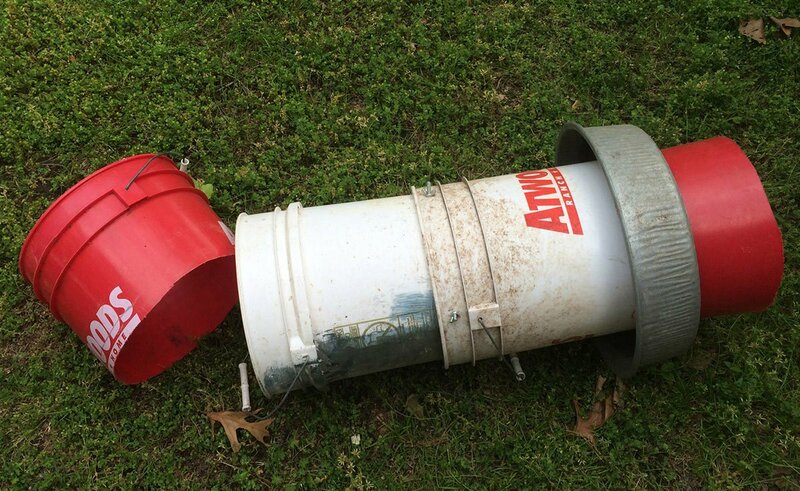 Bucket 2: Using the 1.5″ hole saw drill bit, drill one hole in the bottom of bucket #2. Then, using that hole for access, use the jigsaw to completely remove the bottom of the bucket. 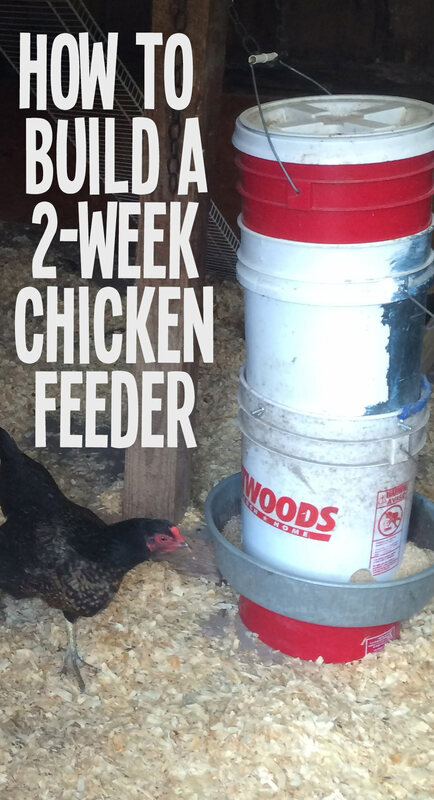 Just like a grain silo, your feed storage bin will store your chicken feed vertically. 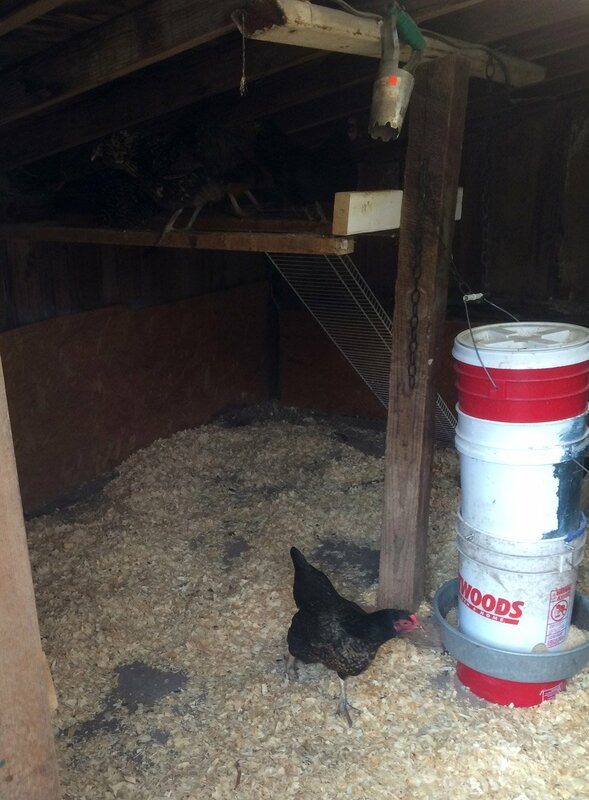 As the chickens eat, gravity will cause the chicken feed to slowly automatically refill the feed pan for several weeks, until the vertical storage is depleted. construction: lay out your pieces in the order illustrated: the cylinder of bucket 3, then bucket 2, then bucket 1 (with feeder holes), then feed pan, then riser. Place bucket #2 partially into #3 (do not insert the bucket all the way down, but instead with bucket #1 overlapping #2 by about 6-8 inches.) Keep the inner bucket from slipping during this process by stuffing rags into the gap. Using a drill, drill a hole with a width the same as or just larger than your bolts. Drill through both bucket walls, insert the bolt, add the nut to the bolt, and tighten the nut halfway. I used wing-nuts because I had them handy, but they aren’t necessarily. Add 2 more bolts in the same way to secure bucket #1 and bucket #2, then repeat the process to connect bucket #2. 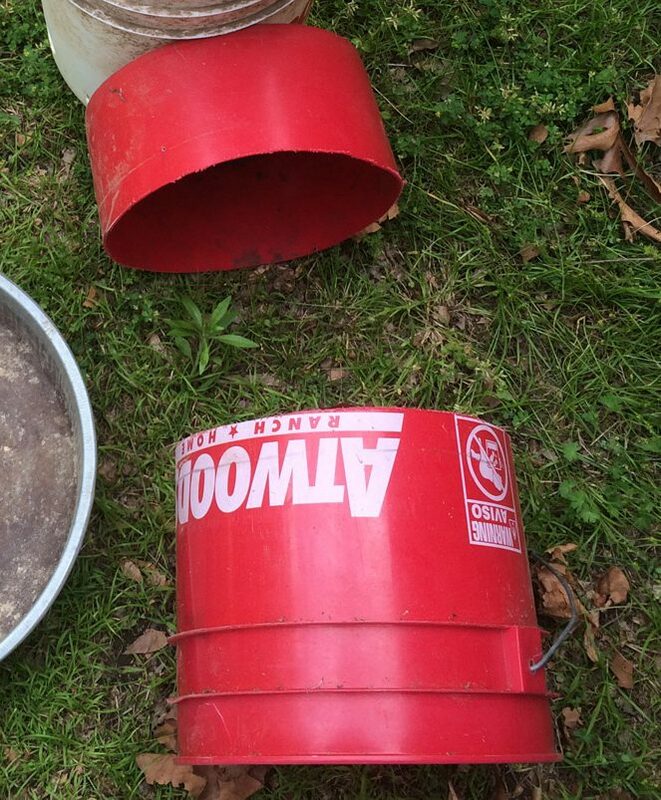 If you require a dust and waterproof seal you can add caulking or expanding foam to the gaps between buckets. 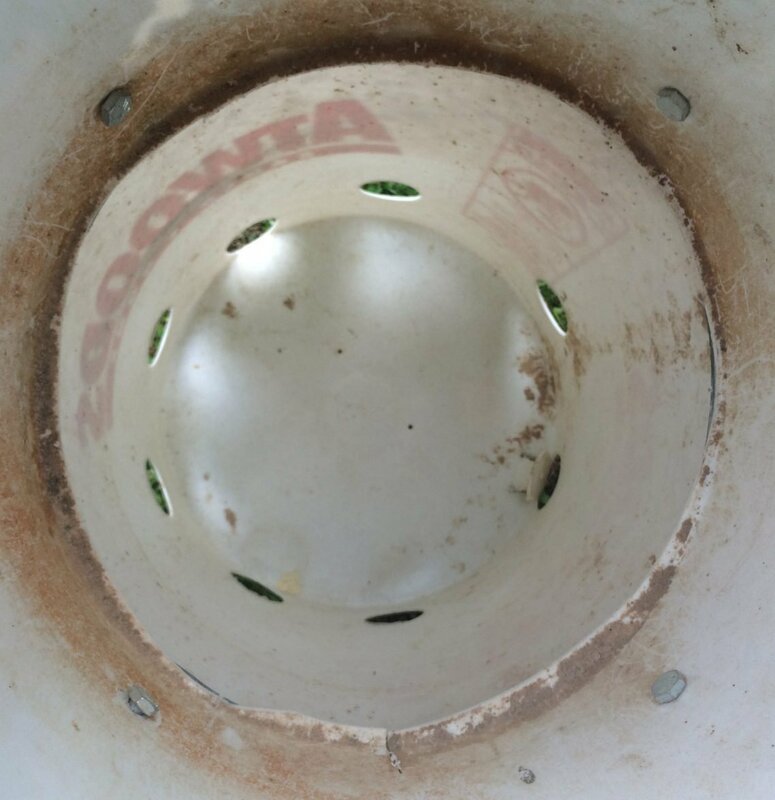 You can use screws (drywall screws will pierce metal and plastics) to attach the base, the feeder pan, and the silo together, however using a heavy duty glue ensures there will be no sharp points protruding anywhere. A heavy duty epoxy glue like Loctite Quickset works well to bond metal and plastic together solidly. 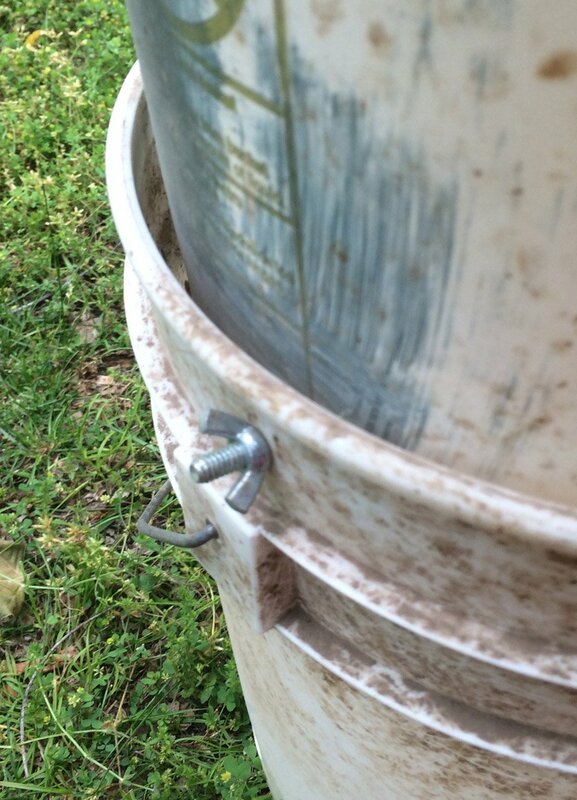 Coat the bottom of the column of buckets with epoxy and press firmly into the center of the feed pan. Next flip the entire feeder (plus attached feed pan over) and take the riser we made from the bottom of bucket #3, coat the bottom with epoxy, turn over, and press onto the bottom of the feeder pan. (so the center of the bottom of the feed pan has a bucket bottom glued to the top and bottom). With the feeder still overturned, add a weight on top and allow the glue to cure for 24 hours. Once the glue has cured, your feeder is ready to use! Please note that even though this feeder will auto-refill your birds’ feeder for an extended time (2-3 weeks, for my flock of 5-7 birds) you still need to check on your birds daily to make sure they have clean water and that the feeder is supplying fresh feed into a clean pan. 1. Feed set out 24/7 will potentially invite rodents. If you notice signs of rodents, for a few nights remove the feeder at dusk, replace with a bucket mouse trap placed in the location when the feeder normally sits, and replace the feeder in the morning. Finished DIY chicken feeder with twist off lid added.